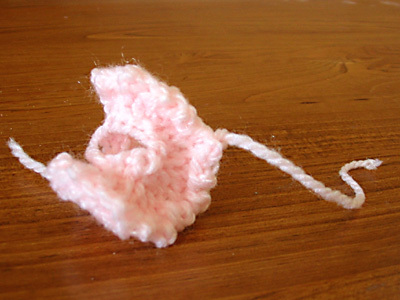 It turns out that crochet is one of those bizarre domains in which it is actually easier to master hyperbolic concepts than Euclidean concepts. This boggles the math mind. I still haven’t figured out exactly what I’m doing wrong to get a trapezoid instead of a rectangle, though I’m sure it’s either what StacyZ said or what KathyMarie said, or some combination of the above. But it turns out that crocheting a hyperbolic model doesn’t require me to know how to turn rows, since it can be done in the round. Woo! 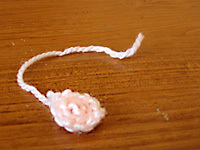 This was my completely uninspiring first attempt at crocheting in the round. I’d actually made a bigger circle, but then decided to frog it because it was so wonky. So wonky that it stopped frogging at this point, tug as I might. Attempt #2 went a little better, except that it sort of reminds me of something that Proper Young Ladies shouldn’t be crocheting. Attempt #3 is starting to look like a hyperbolic plane cone! I stopped at this point since I decided I didn’t like the look of the slip stitch (at least, I think it’s slip stitch) and wanted to try it in single crochet. 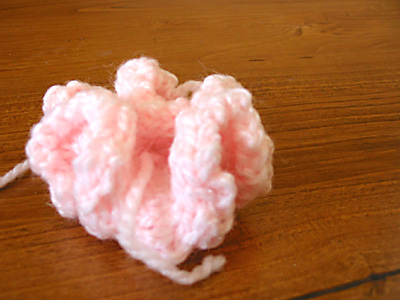 Single crochet apparently makes it much friller, much faster. This was the point at which it became abundantly clear that each subsequent round would take exponentially longer. My fellow grad students seem to be highly entertained by the crochet model of hyperbolic space. Or maybe they’re just nodding and smiling while being silently skeptical of that crazy math-enjoying weirdo. 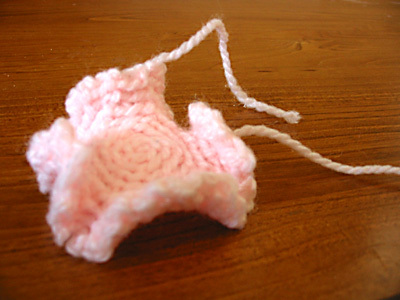 CogKnition posted this on February 9th, 2007 @ 3:23pm in Crochet, Unfinished Objects | Permalink to "Engage the Hyperbolic Drive!" Are you trying to get the hyperbolic shape? Since in knitting if you increase say every 5 sts you will get a hyperbole but if you increase at set points like 8 times in a round you get a circle. So if you want a circle you may be increasing too much in your crochet. Yes, I’m trying to get the hyperbolic shape. The goal is to make a hyperbolic model like the ones linked in the second paragraph.